On Friday June 22nd my girlfriend Phyllis and I went to the DownEast Doll Show in Greenville,NC expecting to see a collection of a variety of old and new dolls, wrong it was the biggest showing of Reborn dolls from tiny babies to children to lifesize all done in various mediums of clays, soap, silicone and resin,sculpy and even Diane Effner was there showing how you could even make porcelain look like reborn painted in Acrylics. People and Dealers from all parts of the world were there although reborning is not my portay and I am old school believing porcelain should only be fired on China Painted I was definetely impressed by not only the turnout and enthusiasm of the people there and the prices boggled my mind but I will continue to Fire on China paint my dolls and leave the reborning to those reborn artist, it is truly a awesome field of imagination. Saturday was another field trip but this time Phyllis and another girlfriend Pat who had come down from Westminster,MD. for the week-end and I went to Raleigh,NC to a doll and collectible show at the Fairgrounds and found some old treasures and saw some old dolls and I even found some miniatures for my dollhouse. It was a hot and sunny day but after a wander through the flea market and a theives market and Good Will Thrift store and lunch we headed home to a well deserved rest and to sort out our loot. Sunday was a day of rest and visiting and going out to eat and saying goodbye as Pat and Karl left to go home Monday AM and I then had to knuckle down and catch up on all my doll repairs. Before I could get realy involved in my customers I had to first mend a 30" set ofRaggedy ANN and Andy my friend Cindy had brought me for my collection in my dollroom. sitting among their new friends in the doll room. 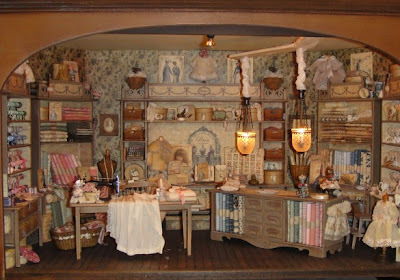 Now I can concentrate on customers repairs before I get into another sidetrack into my dollhouse as I pause to fix a cuppa and have to walk by it as I go in and out of my kitchen and can't resist pausing to move a doll or add a new piece. It is a beautiful sunny warm day here in the little town of Elm City. The temperature is in the high 80's but I am cool as a cucumber under my AC. At present it s still in it's dream stages but am gathering the bits and pieces and all the findings so I can actually begin to work on my Sewing Fabric shop. It will be done in 1/12th scale doll house size. My friend Pat and daughter Niquie in Manitoba Canada and I are working on this together. Mine will be Sewing and Fabric and hers will be done as a Quilt shop as well. 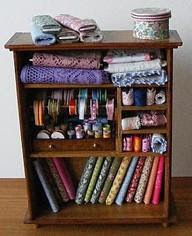 This is a picture of a display I am thinking of trying to make to be a stand alone unit in the sewing room. This the first piece I have made to put in my fabric shop room. We had to cut little 2x3 squares of fabric and fold and wind them on end boards and label them and glue them in place on the laser cut round table kit we got from Deb-Laue's International Dragon supplies a very special member of our Posse group. At present it is sitting in room waiting for other projects as I finish them.